With the pass of time multi screen gadgets like laptops, tablets and smartphones has changed the display feature of website a lot. You cant only depend upon one screen size. Responsiveness is necessary to give users with different screen gadgets easy access to your site. Responsive webdesign technique make your site auto adjustable according to the screen size of different gadgets. You can even create an app for your smartphone readers or can have mobile only site. You should check if your site is responsive or not. For this purpose we have listed 5 best online responsive checker tools that you can use. You can check how your site will look of various screen sizes. Responsinator is one of the best tools to help you check responsiveness of a website. It show your site in different screen sizes. You can see both portrait and landscape mode. 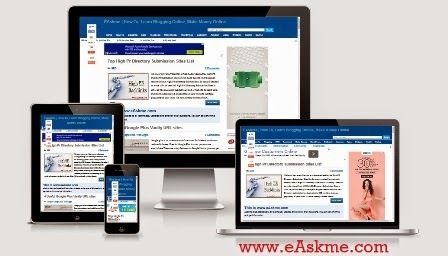 Am I Responsive is a very simple site to check responsiveness of your website or blog. Just enter name of your website and click on go and it will show your website in different screens. Display is not much clear but it is a good free responsive checker tool. Resposinve Design Checker is also a free tool to check responsiveness of your website on different screen sizes including portrait and landscape mode. You can check of different screens as 27 inch monitor, 17 inch workstation, 15 inch Macbook pro, 11 inch Macbook air, IPAD landscape, IPAD portrait, Nexus 7 landscape, Nexus 7 portrait, iPhone landscape and iPhone portrait. Responsivetest.net is also useful site but they do not have one latest iPhoen model. They have wide range of screen sizes like kindle, Nexus and many more. You can easily rotate between portrait and landscape. MattKersley.com has a responsive feature that will easily show you if your site is responsive or not. This is one of the most popular and easiest responsiveness checking site. You can check in different device of screen sizes. There are many responsive website testing tools available online, but there are the best what we have listed here. Its recommended to have a responsive website design. Try them and do where which one you lick to use.